Roku streaming in addition to Cable TV in living room. Flat screen 50' LED TV in living room, flat screen Sony 40' TV in Master, flat screen Sony TV in Guest Bedroom. Roy Yamaguchi designed kitchen features Sub Zero and Wolf appliances, stainless steel refrigerator, wine refrigerator, microwave drawers, dishwasher. Deep soaking bathtubs in both baths. Master bath has walk in shower and separate wash basins. Glass doors from lanai open up to make one large indoor/outdoor great room. Have meals on the lanai as well as watch TV while enjoying the beautiful sunset. Travertine marble floors, exotic Hawaiian woods, stone counter tops through out villa. Central heating and air conditioning, ceiling fan. Free high speed Internet and cable. Playstation 2 game system and games. Free indoor parking, 24 hour security. Six night minimum stay requirement (except for special Holiday periods). The condo itself is quality construction and decorated so beautifully in Hawaiian and oriental theme. The kitchen is fabulous and pantry stocked with some of the basic things you would need such as spices, sugar, condiments, and also some coffee. Dishes and other amenities are provided. We leave whatever we don't use to re-stock it. Lisa is always more than helpful in the planning process and once booked, she provides you with a current updated list of activities and good places to go. We love the Monkey Pod restaurant which is within walking distance for a open air dining experience with live music. The complex has immaculate pools and hottubs, as well as grills and tables you can sit at for meals. A tiki bar for cold drinks by the pool and the biggest boon for us, is that you walk through the pools and out a gate and are at the beach! This particular lagoon is awesome and never very crowded. I can't say enough about how awesome this condo and complex is and as long as we travel to Oahu we will stay here. Thanks to Michael and Lisa for making this available to us. Loved the privacy this room offered versus the rooms overlooking the pool. Did not have to deal with crowds of people like the neighboring resorts also a big plus. Place was clean and had ample sized rooms. Dryer did not work well and light switches took getting used to. Had late departing flight so Lisa offered a much later check out time. Big thanks for that. I would definitely stay here again. Very nice. Enjoyed our time there. The property was nice. Lisa has a great variety of beach “toys” and we loved the pools and lagoon beach! Lisa gave us a great list of activities on Oahu, restaurants, shopping and information that was very helpful. We definitely would recommend this property. I don’t even know where to start. Ko- Alina itself was beautiful and definitely made our first trip to Hawaii memorable. The location of the villa is absolutely perfect. Minutes to the beach and what a friendly and clean hotel area. The villa itself was everything I could of asked for. There was a closet of beach toys, which I greatly appreciate because I didn’t have to worry about packing any. Everything in the unit was up to date and comfortable. The owners answered any questions we had before and during our trip. My family and I will definitely be returning! Lisa's place is unique in Ko'Olina, decorated with some beautiful Japanese art (and even a full kimono on the wall.) The location is convenient...on the third floor with easy elevator access. It does overlook the parking lot but you don't really see that from the unit itself, the view is of palm trees and Disney in the distance. Overall, a great deal and the interactions with Lisa were wonderful, she provided some very detailed info. All in all highly recommended, would do it again, thanks! Resort is on a beautiful oceanfront walkway around four pristine lagoons and beaches. Ted Robinson 18 hole championship Golf Course and home of the LPGA 'Fields Open'. Next to the Marriott Ihilani Spa and Sports Club for lavish spa treatments and tennis. Two wedding chapels,Paradise Cove Luau and Roy's Restaurant in Resort. State of the art Marina where one can catch snorkeling and scuba tours, whale and dolphin tours. Hawaiian Waters Adventure Park, Kapolei Movie Theaters, restaurants and grocery store located in nearby town of Kapolei 5 minutes away. 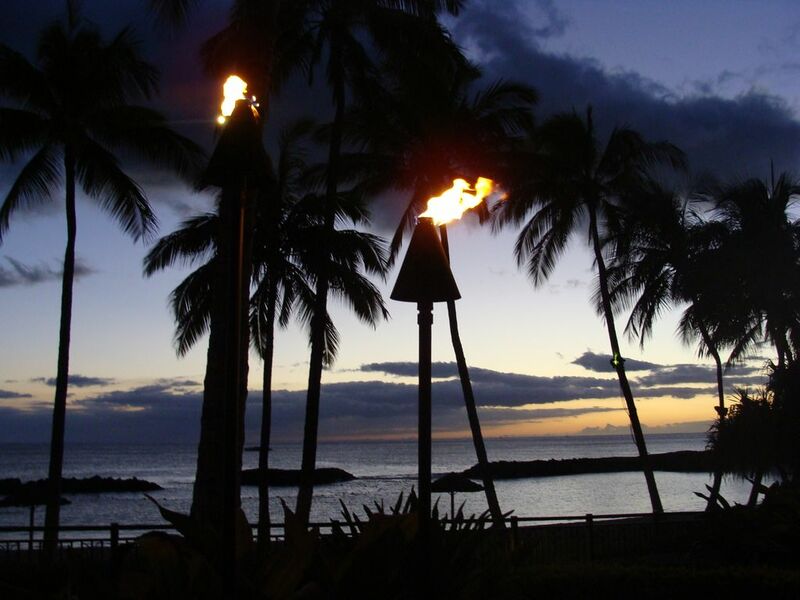 Enjoy a romantic and relaxing inter-island experience yet be 20 miles away from Honolulu Airport. Easily accessible to Waikiki, Pearl Harbor, the North Shore, Polynesian Cultural Center, Hanauma Bay, Waikele Premium Outlets, Ala Moana Shopping Center.